When She Saw What These Three Kids Were Up To, She Started Crying! She was waiting at a stop light when something out of the ordinary caught her eye. Just ahead, there were three teens pulling into a gas station. They got out of the car and walked towards a homeless man, and Jenna Steele wasn’t sure what they had planned. Were they going to hurt him? Say something? She waited and watched. Then, they did something unexpected! 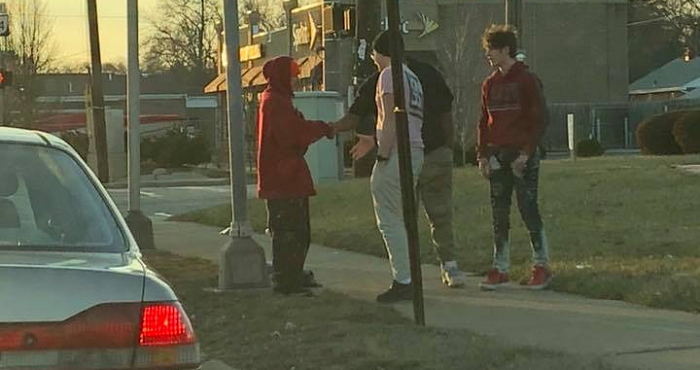 Each boy pulled out his wallet and handed the man a bit of cash. They all shook hands… And the boys went on their way. Steele was absolutely stunned! Had they planned it? Where were they going that they just gave a stranger a bit of cash? She snapped this picture once she realized what the boys had done and hoped that others could be inspired by their incredible actions. It wasn’t everyday that teenagers were on the news for doing great things, and she hoped to change that with her post! Instantly, it went viral! Tens of thousands of shares poured in as her picture spread across the country! She hoped the boys would get the recognition that they clearly deserved, and wanted them to know that even though they hadn’t planned for their actions to be shared, she appreciated their generosity!